The Fall Fundraiser is the major fundraiser that the Home and School hold each year. The amount of funds earned has varied each year. Our goal is typically $30,000 profit each year. The chariperson helps negotiate our school's contract with the fundraising company including making decisions about the fundraising packets of materials to prizes for the kids. The past few years we have worked with MRZ/Red Apple Fundraising. 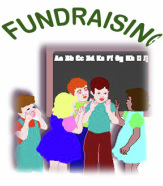 A fundraiser kick-off is held sometime during the first few weeks of school. Students, with the help of their parents, are encouraged to sell items to family, friends, etc.. These items include frozen foods like pizza and cookie dough, gift wrap, chocolates and magazine subscriptions. Students are given incentive prizes by turning in coupons after they sell a certain number of items. Students selling the most items (usually 40 or more) get to go out to lunch and ride in a limousine! What does the Fall Fundraiser pay for? This year the funds are being targeted for new carpet in the Junir High wing which will be installed the summer of 2012. Over the years there are many items that have been purchased for the school that have not been included in the regular school budget. - 2012 - New carpeting in the Junior High rooms. Home and School also financially supports the funding of Sycamore Education and the Accelerated Reader program. (formerly FAN-FEED A NEED) - 2015-2016 Dates and Locations - Coming Soon! This program involves area vendors hosting the school for an event and then donating a portion of those evening's proceeds back to the school. Since most FAN opportunities are restaurant related, this is the "FEED". Since the school needs money to support projects, this is the "NEED". Since we are all SJS families, we are the "FANs"!! Proceeds generated from FAN nights are used to fund things such as field trip transportation and teacher classroom stipends. Some resturants and businesses that currently participate in FAN nights are: Village Inn - 90th & Maplewood Blvd., Runza - 90th & Fort and 172nd & Maple, Godfather's - 108th & Maple, Dairy Queen - 132nd & Maple, Putting Plus - 91st & Maple, Hong Hing - 90th & Fort, Arby's - 90th and Maplewood Blvd., and Mangia Italiana - Irvington Rd. Check the Current Events and Calendar page or watch Virtual Backpack of for specific resturants, dates and times. In 2010 and 2011 Home and School will worked with MRZ/Red Apple to run a one week (two weekend) cookie dough sale. The proceeds were help us to reach our $30,000 fundraising goal for 2011 year. Box Tops, UPCs, Labels, and Caps!! Families are asked to collect and turn in items which are all worth either money or points. Even though the amounts for each may be small, the amounts earned add up significantly over the year.